Just over 6 years ago I posted an interview that I’d done via e-mail with Clifford Hoad from Kings of the Sun (and The Rich And Famous). That was the first interview that I’d done for Rock Radio NI and I’d decided to do something with Clifford because I’d been a fan of both bands for some time, had befriended him on social media and knew there was a lot we could talk about. 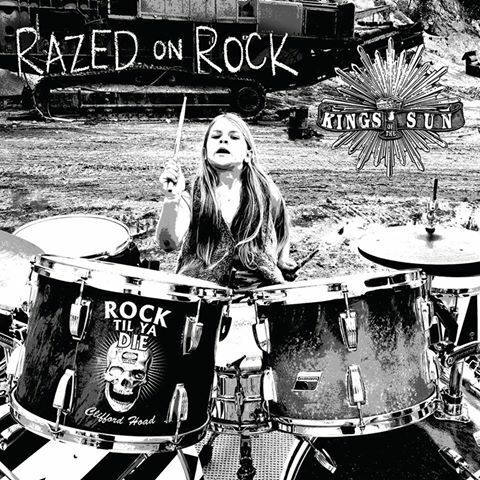 There has certainly been a lot going on since then and Clifford Hoad’s Kings of the Sun recently released “Razed on Rock”, their second album in three years. Having done another e-mail interview in 2013, I decided we needed to get something recorded to broadcast on the Show. I spoke by phone with Clifford at his home in Australia on 20th December and chatted for about an hour. You can hear about 45 minutes of that conversation on the Friday NI Rocks Show that is broadcast on 23rd December (at 9pm UK time), along with 4 tracks from the new album. It’s the longest interview I’ve broadcast, but we had a lot to talk about and it was very much a relaxed chat about a range of things rather than an interview constrained by time limits. I’ll get the interview transcribed and posted here in due course. Kings of the Sun are Clifford Hoad on drums & lead vocals, Rowie Riot on guitar & vocals, Shar Roxon on keyboard, vocals & guitar and Laurie Marlow on bass.